What does a private American Catholic university have in common with government-run Chinese universities? Plenty, if the recent activities of Notre Dame International (NDI) are any indication. From June 22-25, NDI hosted a delegation of 20 Chinese university presidents, which was sponsored by China’s National Academy of Education Administration. This delegation represented universities from China’s interior region—an area the Chinese government has targeted for economic development—and made Notre Dame a three-day stop on its itinerary of three American universities. 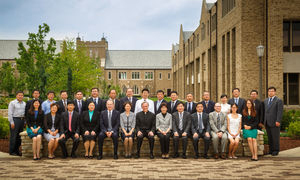 This was the second year Notre Dame hosted the delegation and the visits are an outgrowth of discussions with Hao Ping, China’s vice minister of education, who visited Notre Dame in 2013. “The NAEA delegation came seeking meaningful peer dialogue about best practices in higher education administration, including university governance, strategic planning, and undergraduate education. While it’s true that our universities have important and fundamental differences, we were delighted to share and discuss our many common practices,” said Nick Entrikin, vice president and associate provost for internationalization. Jonathan Noble, assistant provost for Asia and director of Notre Dame’s Beijing Global Gateway, affirmed the common values. “In deepening our relationships with Chinese university leaders, we find shared concern for social well-being, as well as increased emphasis on care for the environment,” he said. 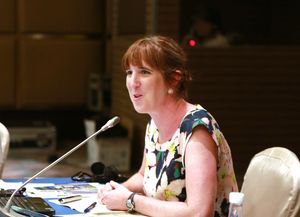 Jessica Hellman, associate professor of biological sciences, and Patrick Regan, professor of political science, were invited along with Entrikin to represent Notre Dame at the July 10-12 Eco Forum Global Annual Conference in Guiyang. The Eco Forum is China’s primary national platform to foster sustainable development and The Green Alliance of Universities for a Sustainable Future—of which Notre Dame is the only American university member —held its inaugural conference and meeting during the Eco Forum. Hellman and Regan spoke on conservation and global change biology and climate change and peace studies, respectively. “Our Chinese partners in the Green Alliance are eager to bring cutting-edge research to China, particularly in developing areas like Guizhou Province. We are currently proposing research to the Alliance that involves Notre Dame’s Global Adaptation Index. This opportunity would allow us to hone and test the Index in an emerging and important part of the world,” said Hellman.